Abstract: Large seaports usually contain multiple terminals serving container vessels, railways, trucks and other modes of hinterland transportation. 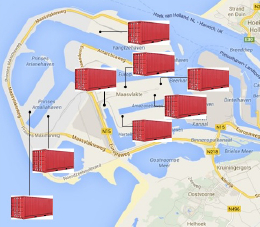 Every time an inland vessel enters a seaport, it visits several terminals for loading and unloading containers. A vessel rotation is the sequence in which a vessel visits the different terminals in a large seaport. Currently, in a seaport like the port of Rotterdam, around 40% of the inland vessels have to spend a longer time in the port area due to the low utilization of terminal quay resources and uncertainty of waiting times at different terminals. To better utilize the terminal resources in the ports, as well as to reduce the amount of time inland vessels spend in the port area, this paper first proposes a new model in which inland vessels coordinate with each other with respect to the arrival, departure time and the number of inter-terminal containers carried, besides their conventional hinterland containers, with the aim to prevent possible conflicts of their rotations. Then a logic-based Benders' decomposition approach is proposed to minimize the total time the inland vessels spent in the port. We compare the performance of the proposed approach with the performance of a centralized approach on the aspects of the runtime, solution quality, and three logistical performance indicators. Simulation results show that the proposed approach generates both faster optimal and faster high-quality solutions than the centralized approach in both small and large problem instance. Reference: S. Li, R.R. Negenborn, G. Lodewijks. A logic-based Benders decomposition approach to improve coordination of inland vessels for inter-terminal transport. In Proceedings of the 7th International Conference on Computational Logistics (ICCL 2016), Lisbon, Portugal, pp. 96-115, September 2016.